The Chipin is a small dog between 8 to 12 inches tall and usually weigh about 5 to 15 pounds. 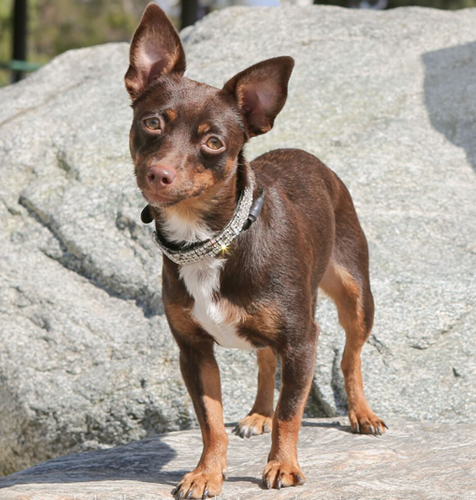 They are a mix of the Chihuahua and the Miniature Pinscher, which are both toy breeds. The Chipin has a short, hard coat that can come in any color from tan to black and combinations thereof. They are very intelligent, fast learners, and easy to train. Due to their short coat, they do not need much maintenance and only require a moderate amount of exercise daily. This breed is excellent with children and pets and make great family pets. However, they can be territorial so they need to be socialized early. The Chipin likes to be with the family all the time and may become bored and bark when left alone. They are easy to train, however you have to stick to rules to make sure they know who is in charge. Even though they are a small dog, the Chipin does not seem to know that and will go after dogs much larger than itself if they believe they are a threat. They do like kids, but small children can be a problem as the mix is so small and can be hurt easily. You should make sure your pet is socialized early so it won’t become aggressive.